Kirk continues his sterling work at West End Comics, and sent a couple of new titles my way in addition to my pull list, which wasn’t huge this week, but was very entertaining! 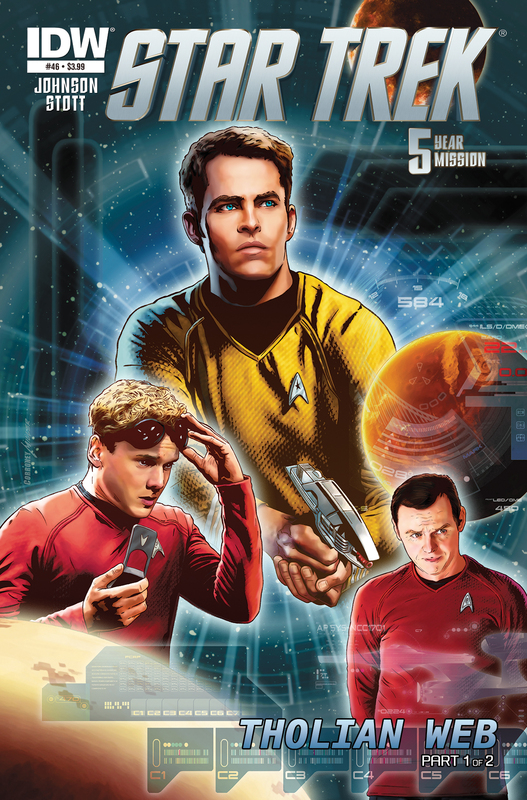 First up is Star Trek (IDW) Issue 46. This is written by Mike Johnson, with art by Rachael Stott, colours by Davide Mastrolonardo and letters by Neil Uyetake. The Enterprise is finally leaving the Delta Quadrant, racing back towards home and their assignment, but upon reaching the edge of the Alpha Quadrant and being able to re-establish contact with Starfleet, the starship is pulled out of warp, and both the ship and the crew seem to be behaving oddly. Material can be passed through, and personalities are shifting. The crew seems to be going insane. To maintain his won control, McCoy induces a coma leaving Kirk and Spock to try and sort out what is truly going on here, while maintaining control of ship and crew. Spock learns they are in interphase, a condition that makes matter and unstable. With the crew falling apart, we see a desperate grab for the bridge, a saucer separation, and the return of a Classic Trek species! I’m not sure about McCoy taking himself out of helping everyone, but I do like everything else in this tale. The comic continues to be a nice solid take on the new series, combining it nicely with new and familiar themes and characters. It’ll have to do until we finally get a new weekly series (COME ON!!). Archie vs. Predator (Dark Horse Comics) Issue 3 features a script by Alex de Campi, pencils by Fernando Ruiz, inks by Rich Koslowski, colors by Jason Millet and letters by John Workman. We’re on issue 3 of 4, and the body count in Riverdale grows higher and higher! I think the thing I am most enjoying about this min-series is that it is completely faithful to the established mythologies of both series, while still being fun, self-referential, and oh-so-bloody! Archie and company are still on the run from the Predator, who is quickly compiling a who’s who kill list of Riverdale as much-loved characters meet their brutal and bloody demise at the hands of the creature. I was stunned by a couple of them, and then of course, there’s a completely inappropriate laugh following a line of dialogue to sum up the scene. I love when you can take two worlds like this that you would never imagine mixing up, but much like the continuing Afterlife with Archie and Chilling Adventures of Sabrina titles, it works, and it works brilliantly. I’m eager to see who is left standing in the final issue! 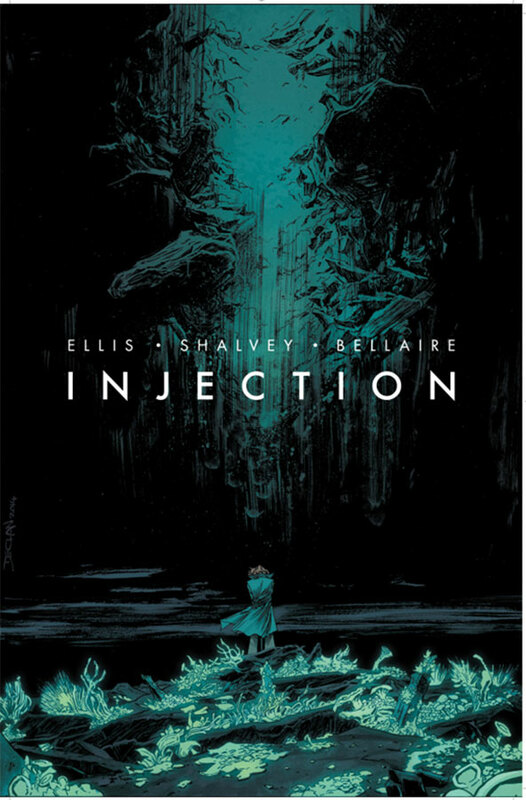 Injection (Image Comics) Issue 1 is written by Warren Ellis, with art by Declan Shalvey, colors by Jordie Bellaire and lettering by Fonografiks. This is going to be an interesting one, Kirk and I had a chat about this one before I left the shop, and I think it’s going to be an interesting ride. We are dropped right into a fully realized world, and for the most part, have no idea what is going on. I just know it’s bad, a little frightening, and looks to be an interesting blend of sci-fi and horror. Professor Maria Kilbride is in hospital, specifically a sanitarium by the looks of it, but when a woman from the company she works for, FPI, arrives with a case that she needs to take, things get even stranger, as we flashback to prior events, and walk through some very benign looking doors that have stunning revelations within. In fact, FPI seems to be reaching out to all of her colleagues who worked on a specific project, touching base one by one, in this strange, seemingly occult-layered (or at the very least troubling and unnerving) world, though still recognizably our own. I found myself intrigued by the first issue because there seems to be a lot going on, but the and context and world haven’t quite been established yet, I love diving into worlds like that, finding how it all comes together, though by the looks of it, it may be a very frightening answer. But right now, I want to know where this series is going and what’s happening in this world! 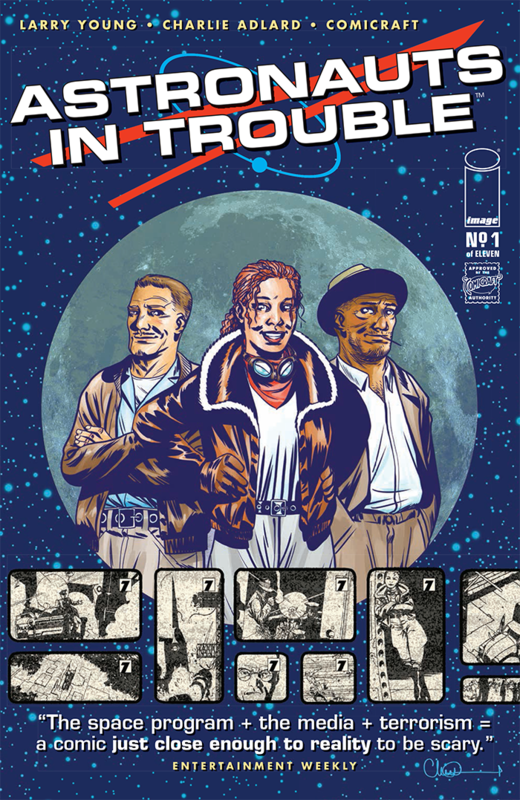 Astronauts in Trouble (Image) Issue 1 b&w comic written by Larry Young and art by Charlie Adlard. This series, only 11 issues, is set in the 60s during the space race. We join the crack newsteam of Kit, Chet and Bob of Channel 7. They’re famous, popular, and are on the trail of a big story, as they investigate a fatal shooting. A shooting that it seems that at least one of the cops they interview is lying about. As they continue their investigation, recruiting female pilot Winsome Sinclair to fly them, they find themselves in Peru, on a secret American rocket base. And there may be a terrorist plot inside the base to topple America’s space dreams once and for all. I think I’ll need to at least check out another issue to be sure! Remember, if you’re in the west end of Toronto, swing by West End Comics, say hi to Kirk, let him know what your tastes in comics tend to be, and watch him recommend something amazing!